Iron and steel industry as raw materials industry, occupies an important position in the national economy. However, now the steel industry is also facing new challenges. Hofmann offers you a complete set of steel heat exchange solutions, from a variety of coolant, lubricating oil heat transfer to coke oven flue gas waste heat recovery, we always provide you with the best quality service. (1) Use NaOH solution to dissolve out the bauxite and the alumina in the resulting sodium aluminate solution is separated out as aluminum hydroxide under the conditions of adding seeds or stirring continuously, that is, seed precipitation process. 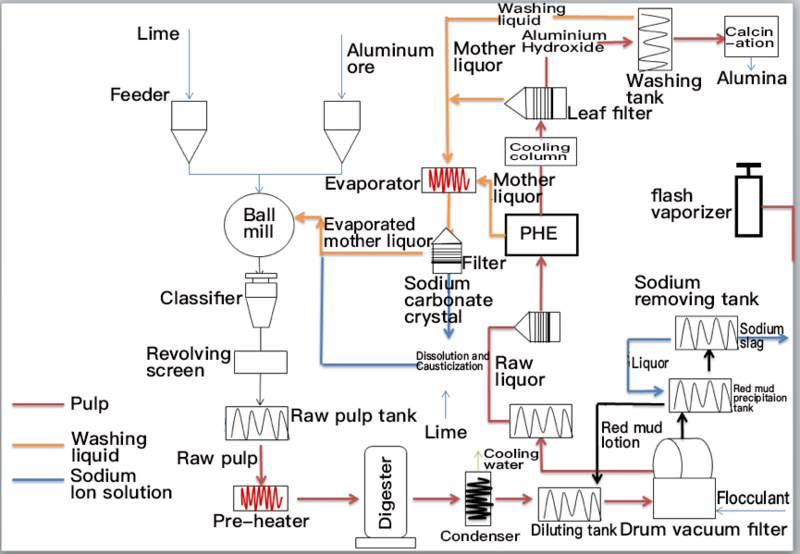 (2) After decomposition, the mother liquor can be used to dissolve out new bauxite at high temperature after evaporation and concentration, that is, dissolution process. Using these two processes alternately, you can get a batch of aluminum hydroxide by processing each batch of ore, which constitutes the so-called Bayer process cycle. Bauxite is a complex aluminosilicate ore with alumina hydrate as the main constituent, the main chemical compositions of which are: Al2O3, SiO2, Fe2O3, TiO2, small amount of Cao and MgO sulfide, trace amount of compounds of the gallium, vanadium, phosphorus, chromium and other elements. The main compositions of industrial sodium aluminate are NaAl (OH) 4, NaOH, Na2CO3, Na2SiO4, etc. Generally, Na2O in NaAl (OH) 4 is called as compound alkali, that in NaOH is called as free alkali and that in Na2CO3 is called as carbonate alkali. The carbonate alkali and caustic alkali are collectively called as the total alkali. (3) After decomposition, the mother solution can be used to dissolve out new bauxite at high temperature after evaporation and concentration, that is, dissolution process. Stir the raw pulp at 90 ℃ for 6~10h before high-pressure digestion and add sodium hydrate alumino-silicate in order to convert silicon minerals into silica slag as much as possible. The process is called as pre-desiliconization. Seed precipitation is to decomposite the sodium aluminate solution in the cooling, seeding, stirring conditions to obtain aluminum hydroxide products having certain performance and mother liquor with high molecular weight used as the circulating mother liquor of bauxite digestion. (1) To eliminate excess water in the process for maintaining the balance of the circulatory system. (3) To eliminate accumulated impurities in the production process. Pre-heater: to heat up the raw pulp to 90 ℃, removing the silicon from the pulp. Condenser: to cool down the raw pulp after high-pressure dissolution, for pulp dilution. Plate heat exchanger: to heat the refined sodium aluminate solution, separated to obtain more mother liquor. Evaporator: to evaporate and condense the mother liquor generated in the whole process, which can be used to dissolve out new bauxite at high temperature and achieve the cycle collection of mother liquor. Due to the sodium aluminate, sodium hydroxide, sodium carbonate, sodium silicate and other substances in the pulp, the selected heat exchange material should be alkali-resistant (such as nickel) while the recommended pre-heater and condenser should adopt the tube-type, in order to prevent the particles in the pulp and the adhesive silicon aluminum from blocking the machine. The mother liquor may contain sodion, aluminum ions, silicon ions, calcium ions, magnesium ions, iron ions, titanium ions, sulfur ions,etc.